There are occasions we receive opportunities. Some years ago I received the advice, “when someone asks you to do something, say ‘yes. '” The reference was to volunteer activity. There are some moments I wished this advice came to me sooner, but then I wouldn’t be where I am and there is nowhere else I’d rather be. One occasion I said ‘yes’ was on this trip. The day continued after our stop in the ancient Roman Forum. We boarded the bus and made the short trip to the Circus Maximus. Today the Circus is essentially a long, flat park. During Natale di Roma (Rome’s birthday, April 21st), the park serves as a showcase for various events including battle reenactments. Our guide talked mainly about the Imperial Palace, which overlooks the grounds. 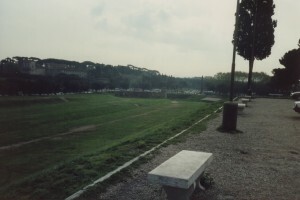 Southeast end of the Circus Maximus. The Circus was essentially a huge race track with two tight turns at each end. Chariot races and other events were held there. According to Pliny the Elder, the stadium seated 250,000, but historians think it was considerably less. Regardless, it must have been something. The original movie Ben-Hur gives an idea of the thrill and danger of the races. The Imperial Palace didn’t seem terribly impressive from our vantage point. The panoramic photo I share below doesn’t show much. It seemed like so much ruin and it was difficult to picture the splendor the palace once had. Appearances are deceiving. When I wrote The Shield of Horatius there was a need to revisit the grounds, and in much greater detail than before. Fortunately, Google Earth allows you to explore the palace as it is now, and the Internet at large gives us access to numerous artistic renderings of the Circus and the Palace (scroll to the bottom of the linked page). One of the things hidden by the ruins is the Hippodrome of Domitian (middle photo of the article). Scholars aren’t certain whether this was a stadium or simply a garden. 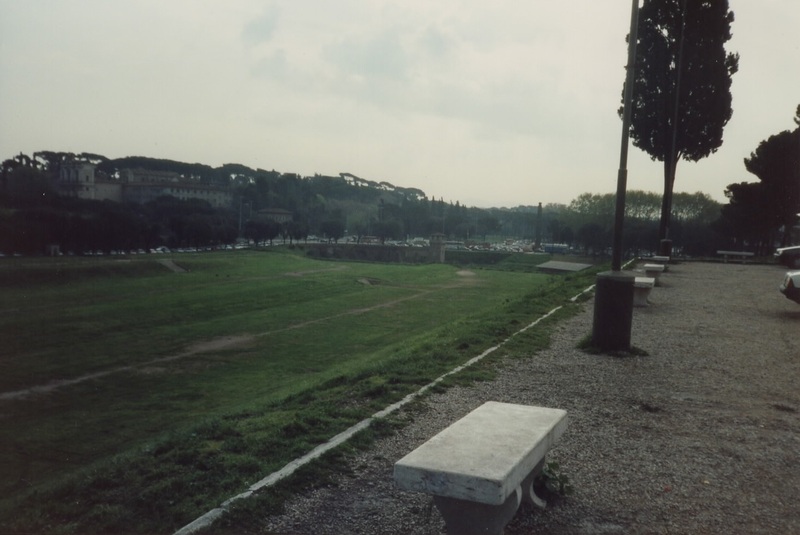 Either way it shows the ruins of the Imperial Palace have more to offer than what is seen from the roadside benches on the other side of the Circus Maximus. A stitch of two photos I took produces this panorama of the Imperial Palace. You’re looking at the Palatine Hill, immediately adjacent to the Forum (on the other side of the hill). In the foreground is part of the Circus Maximus. The line between the two photos is clear at grass level, but hard to pinpoint further up. Domitian expanded the palace significantly in his day and renamed it the Domus Augustana in honor of Caesar Augustus. Augustus, ironically, lived mainly in a borrowed home. The house, like the palace later named for Augustus, was also on the Palatine Hill and is a fairly recent addition to a tour of the area. The house was discovered just 50 years ago. We piled into the bus again and went on a motor coach tour of the city. I do remember the Pyramid of Caius Cestius, but there wasn’t time to snap a photo. Given the area, Giovanna, our guide, probably also discussed the Aurelian Walls. One other moment burned itself into memory. We drove past the Israeli embassy and I saw armed guards at the road gates. I must have been looking the right way this time because the men were armed with Uzi sub-machine guns. It seemed pretty clear they were ready for anything. The lead chaperones on our trip were an English teacher and his wife. I never had this particular teacher for class, but his influence was greater than many teachers I did have. Much of it comes down to this first evening in Rome. Most of the adults, you see, decided to have an evening out. Not a dinner or anything that took hours, they planned to go to the Piazza Navona. The day was pretty long and I felt the extent of our travel to that point, but was privileged to be asked along. An artist draws Molly in the Piazza Navona, from “Molly Goes to Rome.” Illustration by Amy Houston Oler. The Piazza Navona is a large square in what was once known as the “Field of Mars.” When Rome was still pretty small this was the assembly area when they needed to field an army. The same part of Rome today boasts the Pantheon, the Mausoleum of Augustus, the Campo de’ Fiori area, Trajan’s Forum, and many other sites of interest. Piazza Navona was once a relatively small (compared to the Colosseum) stadium. It hosted competitive athletic contests, as opposed to involuntary gladiator bouts. We might call it an Olympic stadium today. The area of the Piazza closely conforms with what was once the athletic field. The city market relocated here in the late 1400’s and there is a continued market today of artists. I can’t put a finer point on this: this brief evening excursion was an important life event. If I only wrote about this and left out all the other lessons learned, the story would be nearly as complete. Well, let’s make an exception for Pompeii. The Piazza Navona was then and continues to be a great place for gelato. Partially because of this it is a great place to take kids. We confirmed these things when Amy interviewed a former coworker who grew up in Rome and takes her kids there often. The interview was part of our research for Molly Goes to Rome. The open air market is part of the attraction, but also the three fountains. The most well known is the Fountain of the Four Rivers. 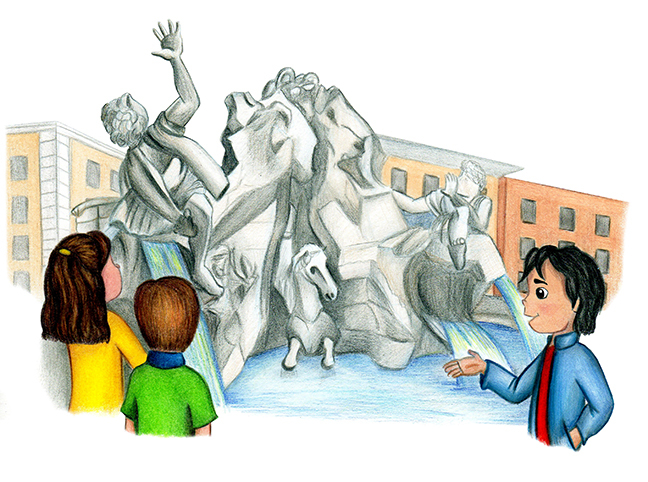 It is a tradition to throw a coin over your shoulder into the fountain and you should do so with the currency of your home country. I brought along a few quarters. One thing I didn’t bring was my camera. The Canon Snappy AF was not a low-light performer, at least not with my photography skills. My memories are certainly romanticized. I recall the lighting of the fountains, the tropical air, the imposing (due to the lack of lighting) edifice of Sant’Agnese in Agone, the few artist stalls still there from the day, and the community of travelers there to experience it all. The crowd was small and everyone seemed to enjoy themselves. Families and small groups took photos, there was a general festive feel. We didn’t stay long, maybe an hour. It was the first bit of Europe I experienced without our large tour group. It allowed me to relax and really absorb the atmosphere. It was similar to the experience in Siena, but magnified. All this and my first instinct was not to go. Why was I asked? Who knows?! I am thankful it happened. 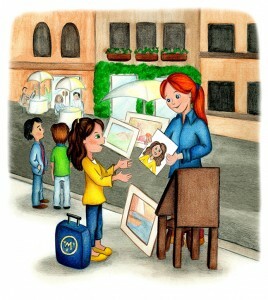 Molly Goes to Rome features two illustrations from the Piazza Navona, more attention than we gave any site. There is simply something more to it. It is, as others say, a place to observe today’s Rome and its culture.